Emily Pollifax is an agent for the CIA. Emily Pollifax is a 63-year old widowed mother of two grown children who volunteered every day at different charities in order to remain useful but found it sadly not fulfilling or, truthfully, not much fun. When her doctor declared her in excellent health but of diminished morale, he asked innocuously if there wasn't something else she had always wanted to do. Her response was, somewhat guiltily, that she had wanted from the time of her youth to be a spy. His gentle laughter was to be expected, she thought, but the remembrance of that old desire didn't leave her. After much thought, she decided to give it one good try and off to Washington she went from her home in New Brunswick, New Jersey. 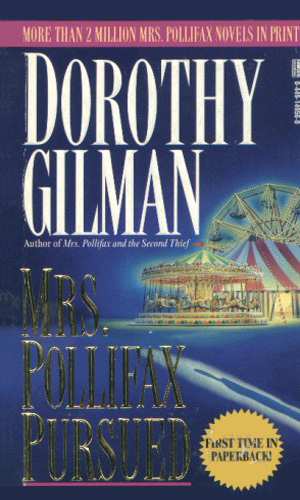 Mrs. Pollifax ages a bit as the series progresses, which is natural, but her love of adventure and her sense of wonder coupled with a lot of common sense stay every bit as strong. She may not get any new gray hair from her wild exploits, since she already has a full head of it, but those who are assigned to accompany her definitely get their share. 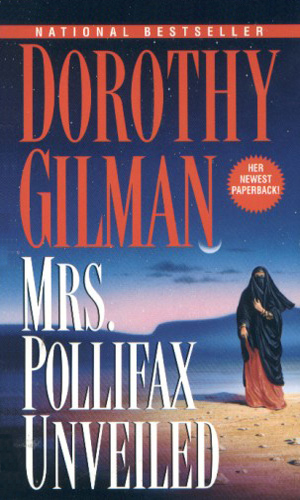 Thus begins the amusing and completely enchanting series of adventures that Mrs. Pollifax, the most unique woman ever to wear a cloak, has had over the years. 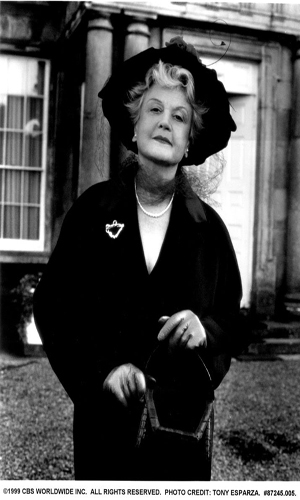 In the thirty years she has been chronicled, she has been compared to virtually every elderly female character in fiction, especially Mrs. Marple, but I stick with my comparison to the intrepid Jessica Fletcher. And that is one heckuva compliment! Oh, when you read the description of the each assignment, read them with a grin because the premises are so bizarre, they are a hoot. And don't let snooty critics scare you away from these books. Yes, they are not 'real' espionage. They are just fun!!! Her first assignment was to play the role of an innocent tourist to Mexico, traveling about as would be expected, but to be at a specific place at a specific time to pick up a package for delivery to the U.S. It was supposed to be as simple as that but things seldom are. Never expecting to hear from the CIA again, Mrs. Pollifax is stunned when her former superior, Carstairs, calls to ask her to fly to Turkey to help in the rescue of a beautiful female spy. The job this time is to smuggle eight passports behind the Iron Curtain in Bulgaria. Luckily, she has a brand new hat that seems just the right size to hide them. Mrs. Pollifax was always quite good at sniffing out the truth but now she needed to sniff out a hidden container of plutonium at a health spa for spies in Switzerland. 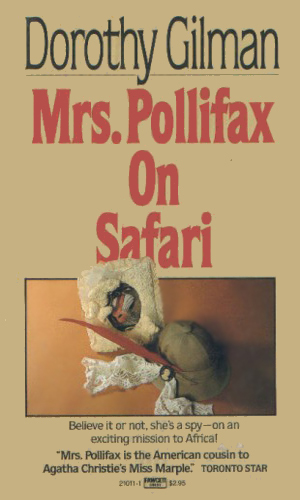 Mrs. Pollifax is sent on safari to take pictures of her fellow travelers, not the countryside, but then someone steals her film and then someone steals Mrs. Pollifax. 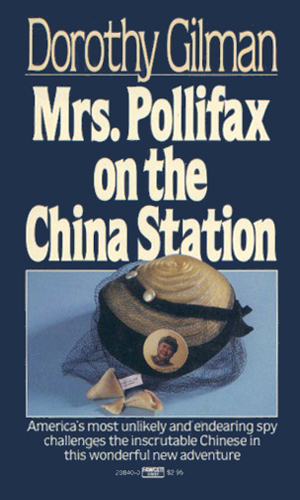 To help sneak a man out of China, the CIA must first sneak a man in and for that they need Mrs. Pollifax to act as a companion to allay suspicions. 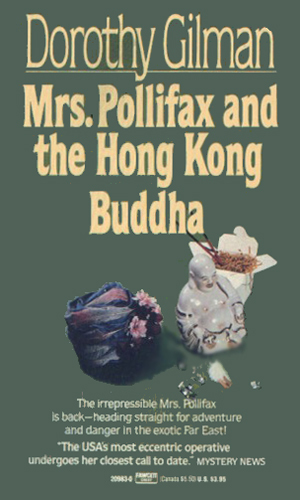 Something is not right at an Agency cover operation in Hong Kong and Mrs. Pollifax, recently remarried, is sent there to assist the agent she helped get out of China. 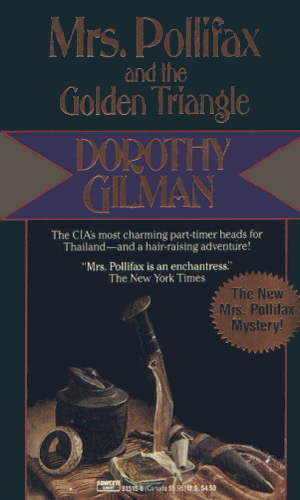 On a honeymoon, Mrs. Pollifax is asked by her CIA boss's aide to do one 'small' thing for him while in Thailand but that favor results in her husband being kidnapped. 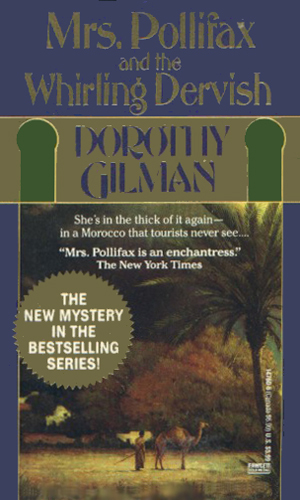 The man she is asked to help in a mission to Morocco seems extremely inept but Mrs. Pollifax begins to feel there is more to this CIA novice agent that first thought. What could be so hard about taking a few pictures at a funeral in the capital and taking them to an agent in Sicily? Mrs. Pollifax finds the answer almost immediately. A young woman hides in Mrs. Pollifax's closet trying to evade killers who want something given her by the son of an assassinated African president. Her new friend from the previous mission heads to Africa to see her friend but Mrs. Pollifax is certain she needs chaperoning. It turns into quite a bit more. 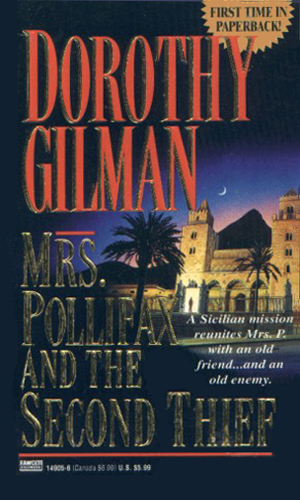 A manuscript that outlines the horror of Saddam Hussein's regime is in Jordan needing to be smuggled out by Mrs. Pollifax but someone is following her very closely. 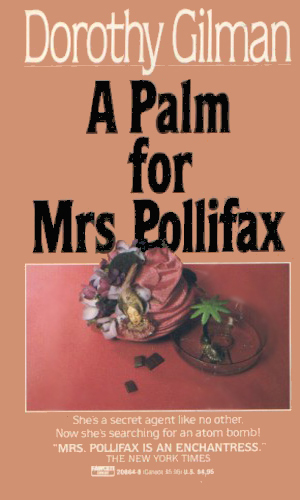 The heroine of a hijacking, Amanda Pym, suddenly disappears in Damascus, prompting the CIA to ask Mrs. Pollifax for help in finding what became of the woman. 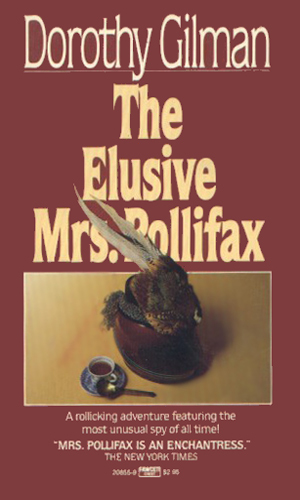 Being a huge fan of the two television series I am about to mention, I mean no disrespect when I describe the Mrs. Pollifax series as "Murder, She Wrote" meets "I Spy". The adventures are interesting and the characters captivating. 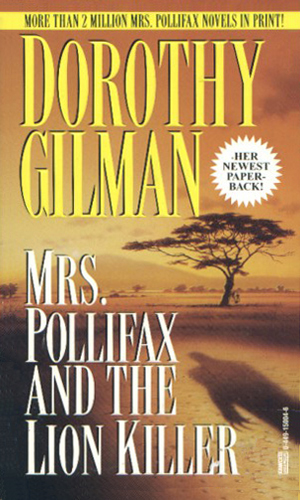 Two different movies have been made about the adventures of Mrs. Pollifax, both using a mixture of plotlines from different books. 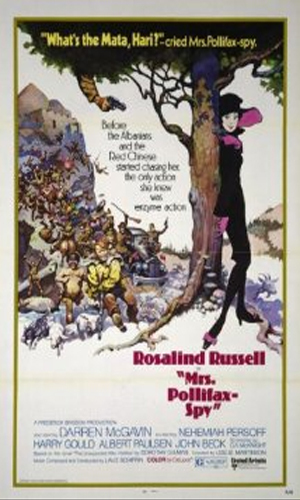 The first, made in 1971, was one of Rosalind Russell's final roles but one she wanted to do enough that she actually worked on the screenplay, under a pseudonym. The movie, costarring Darrin McGavin, did not fare very well but is a good watch nevertheless. The second came in 1999 and starred Angela Lansbury (see! I told you she reminded me of Mrs. Fletcher). It was a made-for-television movie on CBS which also did not succeed as well as it should have, probably because they put it on a Thursday opposite ER instead of on a Sunday which was truly Ms. Lansbury's night for so many years. With her children grown and gone, Mrs. Pollifax looks for something useful to do with herself and, seeing she is, in her opinion, expendable, she volunteers at the CIA. Surprisingly they have something she can do. On her doctor's orders, Mrs. Pollifax decides to fulfill her life's dream. He never suspected it was to be a spy. 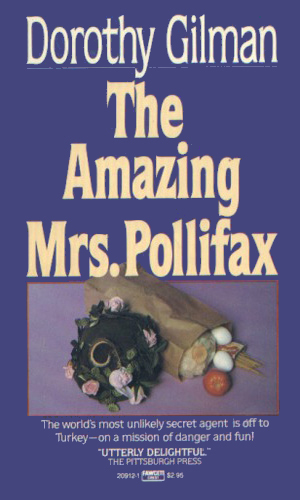 As can be seen in the About section, I really like Mrs. Pollifax. 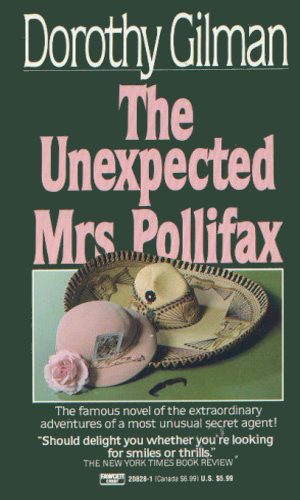 The adventures are fun and light, the danger presented but not overwhelming, and the character of Mrs. Pollifax is always a delight. I did not read these thinking that this is the way 'real' espionage is like but I did read them and enjoyed reading them while thanking Ms. Gilman for being kind enough to write them. 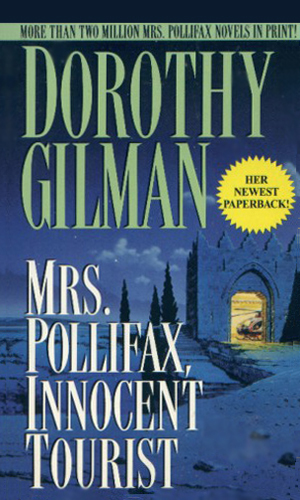 Ms. Gilman was chosen as the 2010 Edgar Awards Grand Master, an honor bestowed on those who have given so much to crime and thriller fiction and an award she truly deserved. Well done, ma’am!